Another fantastic investment opportunity in Playa del Carmen. Definitely the best price for private Homes for Sale in the exclusive Club Real Neighborhood. 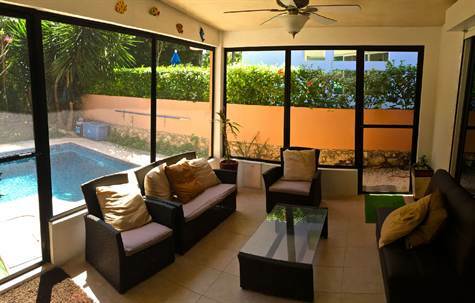 Enjoy the opportunity to invest into Playa del Carmen Real Estate and own this very charming 1 level caribbean villa in the Golf Course Community of Playacar. The property is well kept and maintained and is ready to move in as the owners are selling it completely furnish sand equipped. The three bedrooms are very spacious and are on the left side of the building while next to it you have a very large and open kitchen and living room area. The patio has mosquito nets and is perfect to spend the afternoons overlooking the Playacar Golf Course. The garden is perfectly landscaped and you have your own pool and BBQ. Between the Golf Course and the property line is a common area which could be used as a extension of your garden. Club Real is a gated community inside Playacar and offers community pools and tennis courts, low fees, 24/7 security and is a perfect place to spend time with your family. Pool practically attached to home! When looking for homes for sale in Playacar Golf Course Community you can choose either between a private house or like this one or a property being part of a community with shared pools, huge common areas, including gardeners and maintenance crew as part of the HOA. This complex has only 4 Playcar Golf Course Community houses for sale left, so don’t wait too long. The interior offers open floor plan concept, modern design and state of the art construction quality. Common areas are very well taken care of and offer some of the best pools and landscaping in the area. Pictures are taken from the model unit, so it comes unfurnished, but I suppose everything is negotiable. Click here to see more pictures and to go directly to the listing. If you want a house, but do not like the idea of taking care of your own garden and pool, then you will definitely want to check this one out. 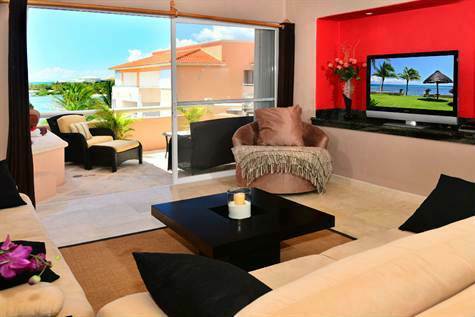 This 3 bedroom homes offers a very modern design on a 2 level floor plan, inside the gated community of Playacar. Beautiful common areas and pools, great landscaping and a perfect place to live the Caribbean Dream. Priced at $350,000 USD, this home is a steal. You’ll enjoy 2,000 square feet of living space on 2 stories with 3 spacious bedrooms and bathrooms. For more properties in this area, please visit our website and find us on Point 2, Facebook and Youtube. Live next to the beach! I imagine most of you have the tickets booked and are about to pack the suitcases to come down to Mexico and exchange snow and cold for beach, warm weather and some good tequila filled margaritas. This could be a perfect place for you to spend your vacation next time here, in your own beautiful 2 bedroom condo right at the beach. 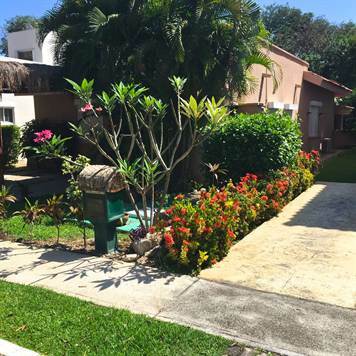 Very tranquil and safe gated community of Puerto Aventuras, with the only marina in the state and an amazing golf course close by. You have to schedule a showing to get the full experience of a unit like this! This wonderful condo for sale has 2 bedrooms and 2 bathrooms with an alarming 1,800 square footage of living space, you will never want to leave! The unit has just been remodeled to offer you simply the best amenities and luxuries such as new bedding and draperies, new accessories in all the bathrooms, new art in the dining room and 2 flat screen TV”s! 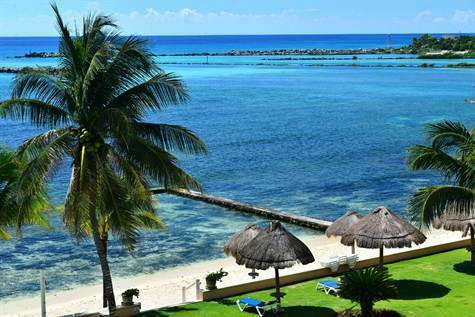 Feel right at home in this beautiful 2 bedroom beach front condo located on the 4th floor of the newest condo development in Puerto Aventuras! The spacious living area opens onto a terrace from where you can enjoy a magnificent view. The dining room sits 6 people comfortably. The kitchen is fully equipped to cover all your culinary needs. The master bedroom has a king size bed and full bathroom. The guests bedroom has 2 queen size beds and en suite bathroom. The laundry room has half a bath. So what are you waiting for? Also an excellent investment for Playa del Carmen real estate with Playa just a short 10 minute drive away. Priced at $360,000 USD, it won’t last! Click here to see more amazing pictures to get a better idea of the area and sheer joy you will feel stepping out your door with the beachfront right there. You have to feel it to believe it!